Through the generous support provided by Yuri Fulmer, a private donor with a vision of educating the hearts of children in Northern BC, the Dalai Lama Center for Peace and Education has launched a Heart-Mind in the North initiative to explore ways of integrating Heart-Mind well-being (HMWB) across sectors in rural BC communities. Our project began in May of this year, when we were welcomed to Fort St. John by Mayor Lori Ackerman and connected to key organizations and individuals working with children and families in FSJ. During this visit, we held a series of consultation meetings to better understand what role our work could play in supporting children’s social emotional development within this community. 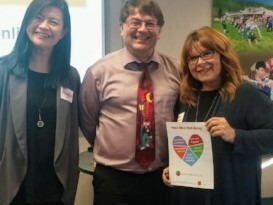 Through many conversations, we heard that there was not only a need, but great enthusiasm for integrating Heart-Mind well-being into the amazing work that is already being done by parents, educators and professionals in Fort St. John. After our return, we began planning a return visit, and a series of HMWB Workshops to engage individuals in the community who are well positioned to positively influence children’s development of important social and emotional learning skills. With the help of Heather McBryan, Child Care Resource and Referral Services, David Sloan, Superintendent of SD60 Peace River North, and several community groups, in one very busy week in October, we were able to provide HMWB workshops at no cost for administrators at Peace River North School District, members of the Family Friendly Coalition and the general public, early childhood educators and ECE students, the North-East Aboriginal Business Center, and the Treaty 8 Tribal Association. These well attended sessions were planned with the each organizations. We also provided informational sessions for the United Way of Northern BC and Rotary Club of Fort St. John. 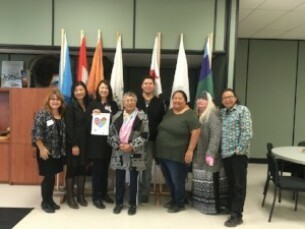 We look forward to deepening our connections and work with the amazing individuals we’ve met so far through this initiative, while also establishing new relationships and funding partners to assist us in ensuring a longer term vision and plan for nurturing Heart-Mind well-being in Northern BC. What Colour Heart Do You Use? 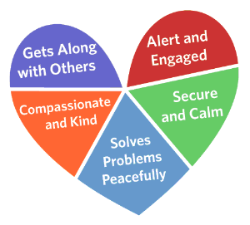 This new Heart-Mind Online resource illustrates how the Heart-Mind Well-Being framework can be easily adapted for kindergarten students to increase their understanding of the five important positive human qualities: Secure and Calm, Alert and Engaged, Solves Problems Peacefully, Compassionate and Kind, and Gets Along with Others. 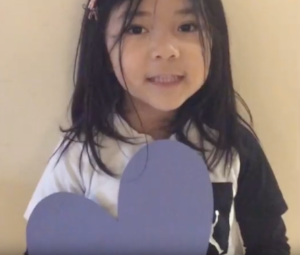 After participating in a Heart-Mind in Schools workshop delivered by the Dalai Lama Center for Peace and Education, a kindergarten teacher at Spul'u'Kwuks Elementary School, in Richmond, created a lesson to help students better understand and regulate their feeling and actions. She encouraged them to think about which colour heart (each of the five qualities is represented by a coloured heart) they were using while playing with friends and also to notice which colour heart their friends were using. Check out the resource along with a lovely video of this activity in action and be inspired by how a small act on the part of a student or educator has the potential to shape the way a child views themselves and is able to positively impact others in the classroom and potentially for years to come. We are excited to announce that we have two upcoming events in November. 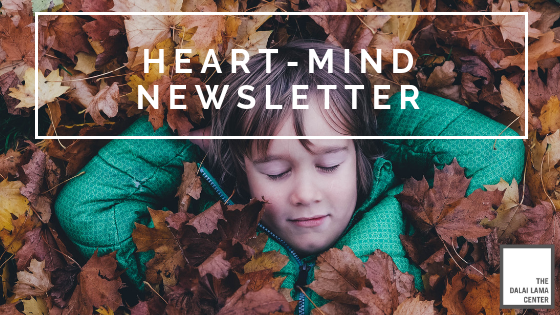 The first is a full day Caring For You Retreat on November 26th and the other is a Heart-Mind Well-Being: A Focus on Adolescence Workshop on November, 27th. 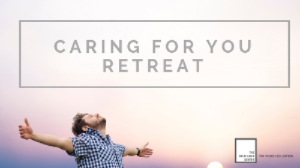 The Caring for You Retreat will integrate research and practice with community building activities, yoga, stress management techniques, meditation, and journaling. Through the exploration of self-care strategies, including breathing exercises and mindfulness practice, participants will have an opportunity for self reflection and to identify ways of integrating Heart-Mind well-being in their lives. In the workshop " A Focus on Adolescence" we share current research, scientific knowledge, best practices and practical strategies related to the promotion of social and emotional development in teens. The workshop is designed for adults who care for or work with teens.